Join Relay For Life to help support cancer patients with free rides to chemo, free places to stay near hospitals, and a 24/7 cancer help line. Let's team up to fight cancer together! Relay For Life is the ultimate team fundraiser for the American Cancer Society that brings communities together to fight cancer. 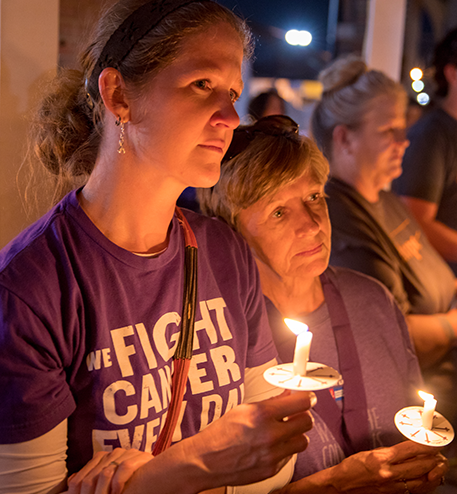 It's an opportunity for us to remember loved ones lost and honor survivors of all cancers. Traditionally, Relay events last anywhere from six to 24 hours with teams of survivors, caregivers and supporters taking turns walking around a track or designated path. But today, communities are giving events their own unique spin. Events can range from a block party atmosphere to more of a local pep rally, complete with fun games and activities, food, music and more! 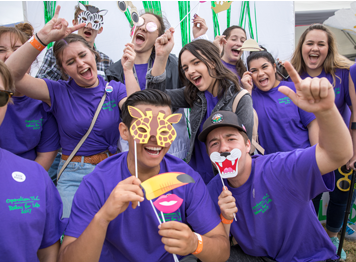 But every Relay For Life event shares the same goal — to take down our biggest rival, cancer. A standing ovation is in order. Survivors and people currently battling cancer take a lap as they're celebrated and cheered on by their biggest fans. 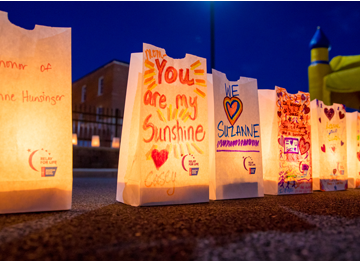 After sunset, Luminaria are lit to honor lives lost to cancer, celebrate survivors, and to show those impacted by cancer that they are not alone. Beating cancer is a feat worth celebrating! Relay brings communities together to recognize, honor and rally around survivors who inspire us with their courage. Nearly 1.3 million Relay participants team up at over 2,000 events nationwide to raise money that helps the American Cancer Society attack cancer from every angle . Here are a few ways Relay donations helped cancer patients last year. funding potentially life-saving cancer research grants. calls and chats from patients/caregivers seeking info and support. nights of free lodging provided to patients at Hope Lodge®. Help us attack cancer in your community. 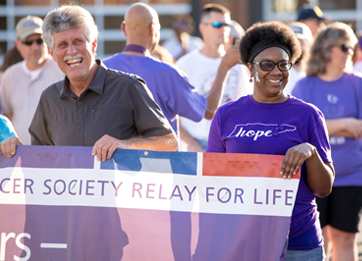 Join Relay today to help the American Cancer Society save lives, celebrate lives, and lead the fight for a world without cancer.